Large colour poster advertising a Prize Draw held in 1998. All profits will help provide British Red Cross services in your local community. 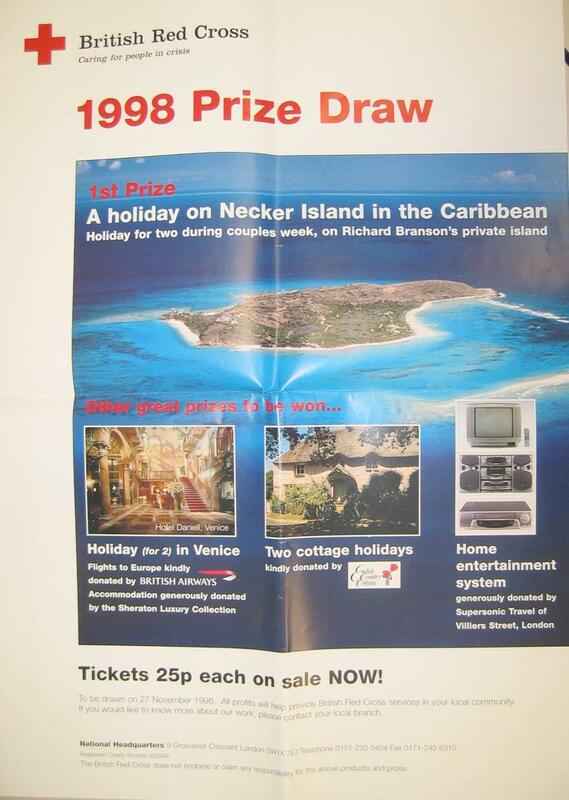 Large colour poster: '1998 Prize Draw. 1st Prize. A holiday on Necker Island in the Caribbean. Holiday for two during couples week, on Richard Branson's private island. Other great prizes to be won... Tickets 25p each on sale NOW!. To be drawn on 27 November 1998. All profits will help provide British Red Cross services in your local community. If you would like to know more about our work, please contact your local branch'.